The University of Wisconsin Department of Family Medicine and Community Health (UW DFMCH) honored numerous faculty and staff at its annual Renner Hansen awards ceremony on November 9, 2016, at the Pyle Center. 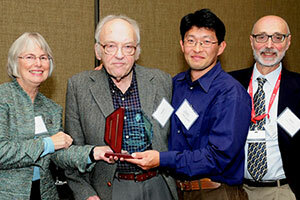 Jonas Lee, MD, received the Marc Hansen Lectureship Award. A 1999 graduate of the DFMCH’s Madison residency program, Dr. Lee now practices at Access Community Health Center/Wingra Family Medical Center. In his presentation, “Unit of Measure,” he spoke about his upbringing, about volunteer experiences in medical school that taught him the importance of community service, and how working at a federally qualified health center in Beloit, Wisconsin, provided opportunities to make a difference at both the individual and the systems level. Susan Skochelak, MD, MPH, received the John H. Renner, MD “Wisconsin Idea” award for her leadership as a medical educator at the local, state and national levels. Dr. Skochelak came to the University of Wisconsin in 1986, where she practiced as a family physician at the Northeast Family Medical Center and later moved to Verona Family Medical Center. Her interest in education led her to develop the DFMCH’s first required medical student education programs, the Primary Care Clerkship and the Generalist Partners Program. She recruited Doug Smith, MD, Cindy Haq, MD, Richard Brown, MD, MPH, and Michelle Grosch to create the statewide Primary Care Clerkship. Her efforts to create a rural medical student education program brought Byron Crouse, MD, to the department, and she also recruited Dr. Haq to develop urban medical student education programs at the SMPH. In addition, she was the director of the Wisconsin Area Health Education Center, chair of the Consortium of Primary Care for Wisconsin, and a member of the governor’s Rural Health Development Council. Dr. Skochelak served as senior associate dean for academic affairs at the SMPH from 1997 through 2009, after which time she became the vice president for medical education at the American Medical Association. In that role, she has created “Accelerating Change in Medical Education,” a $20 million grant program that supports a consortium of 32 medical schools that are making transformative changes in medical student education to create the medical schools of the future. Special guest Larry Pheifer, executive director of the Wisconsin Academy of Family Physicians (WAFP), honored the six DFMCH faculty, plus our Family Medicine Interest Group, who won AAFP awards in 2016. He was followed by Brandon Wimmer, WAFP director of strategic initiatives, who congratulated the DFMCH’s Jacqueline Gerhart, MD, for being named the WAFP Family Medicine Educator of the Year. Jonathan Temte, MD, PhD, received the DFMCH’s Faculty Excellence Award. Colleagues praised his intellectual curiosity and humanism; his diligence, persistence and positive enthusiasm; and his commitment to work collaboratively to improve community health through research and education. Wen-Jan Tuan, MD, MPH, received the DFMCH’s Robert Drachenberg Staff Excellence Award. In his role as a senior data analyst and database administrator, he demonstrates an “enthusiasm to uncover buried answers in the data.” He also showed considerable initiative in planning and executing the U.S.-China Symposium on Family Medicine and Community Health. The UW Health DeForest-Windsor clinic’s OB care team received the James E. Davis, MD, MS, Quality Improvement Award for their project to improve the practice environment for family physicians who provide obstetrics care. Jennifer Edgoose, MD, MPH, received the William E. Scheckler, MD, Outstanding Research Publication Awards (Faculty or Staff) for her publication describing whether an intervention called BREATHE OUT improved clinician satisfaction during visits with patients perceived as difficult. Primary care research fellow Vernon Grant, PhD, received the William E. Scheckler, MD, Outstanding Research Publication Awards (Medical Student, Resident or Fellow) for his publication describing the effect of an eight-week recess intervention on physical activity levels in children attending elementary school on an American Indian reservation. Kevin O’Connell, MD, and Susan Skochelak, MD, MPH, received Chair’s Awards. Dr. O’ Connell was honored for his years of service as director of the Wausau residency program (read a tribute here). Dr. Skochelak was honored for her contributions to the DFMCH, the SMPH and the state of Wisconsin, and to recognize her 2015 election to the National Academy of Medicine.